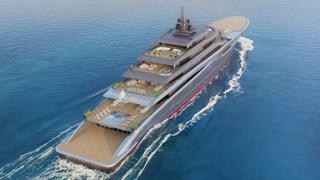 Berlin-based yacht designer Theodoros Fotiadis has released further details of his 118 metre concept Vitality, including the first interior renderings. Fotiadis told Boat International that he has proceeded to the interior design stage after attracting interest from a potential client. 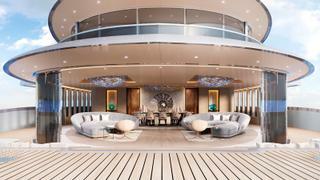 As the renderings above show, the foredeck would flow seamlessly into the bow lounge, where guests can relax on the two large curved sofas or enjoy a formal meal around the dining table, which is illuminated by a spectacular chandelier. 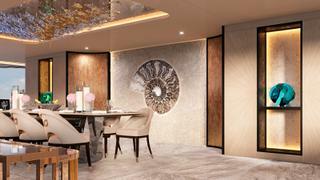 A large nautilus shell motif on the amidships bulkhead adds to the beach club feel on board Vitality. 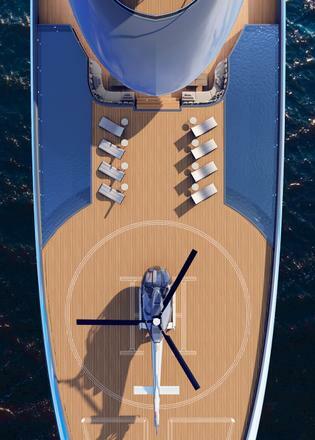 Power would come from a quadruple MTU 20V4000 M93L engine set-up for a top speed of 22 knots and comfortable cruising at 18 knots. What’s more, Vitality should be capable of a seriously impressive range, thanks to a total fuel capacity of more than 880,000 litres.